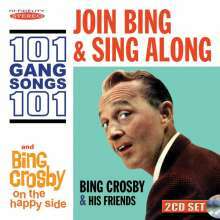 Der Artikel Bing Crosby (1903-1977): Join Bing & Sing Along / On The Happy Side wurde in den Warenkorb gelegt. Das erste Mal auf dieser 2-CD-Ausgabe Join Bing & Sing Along 101 Gang Songs gepaart mit »On the Happy Side« mit Bonustracks ist eine willkommene Veröffentlichung für Bing Crosby Fans. Hörprobe Track 5: While Strolling Through The Park One Day/Today Is Monday/Big Rock Candy Mountain/Oh Dear! What Can The Matter Be?/Oh Where, Oh Where Has My Little Dog Gone? While Strolling Through The Park One Day/Today Is Monday/Big Rock Candy Mountain/Oh Dear! What Can The Matter Be?/Oh Where, Oh Where Has My Little Dog Gone?